This FREE event is brought to you by a coalition of organizations from the Canadian Network for Maternal, Newborn, and Child Health (CAN-MNCH). 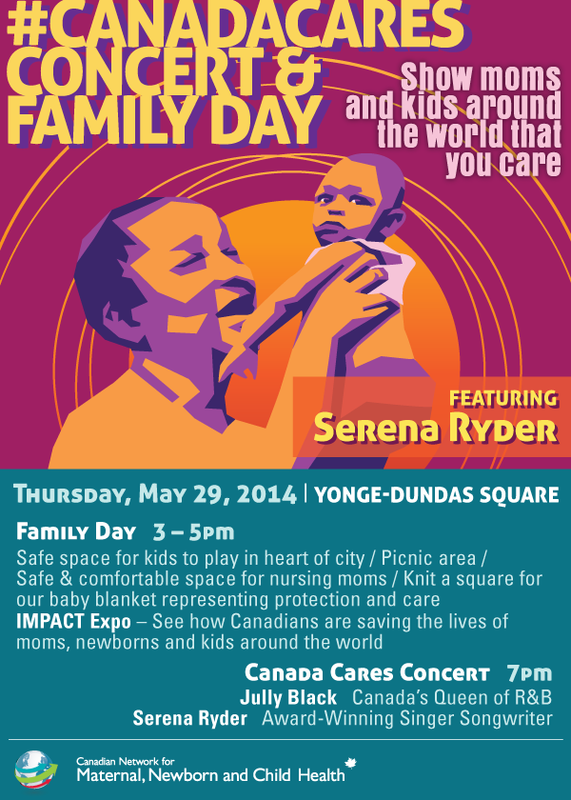 Come celebrate Canada’s leadership in saving the lives of millions of mothers, newborns and children, around the world. Learn how Canadian organizations are working to end global maternal, newborn and child mortality – in a family-friendly environment – and show your support for this cause through our interactive Twitter wall. Moms can enjoy a safe and comfortable area for nursing, and take part in knitting a vibrant ‘Blanket of Hope,’ to show their solidarity with moms and newborns struggling to survive. This blanket will be sewn together with blankets from other countries, into a global Blanket of Hope (which will be displayed in at an upcoming political summit for moms and newborns, in Johannesburg). The event will feature a supervised play area for children, with face painting and a variety of activities, plus a splash fountain. Award-winning singer songwriter, Serena Ryder, will perform in the evening, with Canada’s Queen of R&B, Jully Black, as the opening act. This is a free event, so come out, bring a picnic and enjoy the day!